This section describes the implementation of my OS at a high level. Not all of it is working right now but this is the basic idea. You can download the current code but it is far from being complete. The OS is not meant to be an operating system like linux or windows where user application can run. The purpose is to provide a basic platform to implement different "firmwares". A firmware is a set of application in this context. Depending on what you want your NGW100 to be, you would run a different firmware (set of applications) that would drive the board through services provided by the OS. The following picture describe what components will be handled by the OS. Note how the USB controller, AC97 device, timers and several other devices are not represented in the graphics. This is because the OS won't take care of these devices. Drivers for these devices will be implemented as applications. So if I want to make my NGW100 device act as a USB storage device, I would have to write an application that implements the USB Mass Storage device protocol and use the file system module of the OS through the API. So building a router with my NGW100 would be a matter of developping applications that would run cooperatively like a serial shell app, packet-routing app, web-server app, usb mass storage app, etc. Booting is currently done with u-boot as I don't have a JTAG tool yet. Eventually, I would like to have it boot on its own. Since u-boot initializes stuff for me, I will be own my own when I take the step. With u-boot, I am downloading the firmware trough a tftp server and I save the image in the parrallel flash at address 0x00100000. I then execute the code from address 0x80100000 (remember, 80000000 is mapped to 0x00000000). Executing from that address makes the code run in priviledged mode. After the kernel will start running and all initialization is done, it will look in the dataflash for the boot script. This script contains a list of applications (located on dataflash or SD card) that should run at startup and a some other settings. Reset some CPU settings to default. I looked at what u-boot was doing on reset and I do the same. Configure the PM to enable PLL and run at 150MHZ. The OS will use paging and segmentation at the same time. This means that the first 2gigs of addressing space will be separated in 4k chunks and remapped on the physical space in another way. More information on this can be found in the AVR32 architecture section of this site. Paging allows us to remap the memory in a non-contiguous way. Application processes will use the SDRAM memory. Only the SRAM and SDRAM memories will be paged. The page table will be stored in the sdram and will be 64K in size (8192 pages). 8192 pages will allow us to maintain 4k pages for the reset of the SDRAM and the whole 32K sram. The sram pages will be used as the heap for the kernel and will be protected. The SDRAM pages will be set as private and will be associated with the owning process ASID. In the page table, a page entry will take 64bit in size. The first 32bit is going to be structured like TLBEHI. This 32bit field will allow us to find an entry on the table based on the requested page number and ASID. The last 32bit will be a copy of what should be copied in TLBELO when finding a match for TLBHI. The first 8 entries in the page table will be reserved for the SRAM. The rest of the entries will reflect the physical SDRAM space in the same order. The first 32bits of each entry do not have to be linear though. 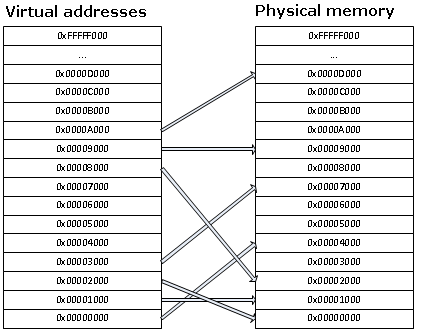 The page table will also be used by the kernel to track available memory. A page with the "v" flag cleared means that this page is not reserved by any application so that 4k of memory is free. When allocating memory to a process, the "v" flag of the reserved pages will be set. Go through the list of process and find the next one to be switched to in a round-robin fashion. Using the stmts instruction, save all registers from ro to r14 to the application space buffer. stmts will save the registers from the application context. We will be executing from INT3 so registers r8 to r14 will be shadowed, meaning that even if we change them, stmts will pickup the right values that were assigned before entering INT3. Save the RSR_INT3 register to the application space. RSR_INT3 contains the system flags before entering INT3. If the interrupt occured between a "cp.w" and a "breq", teh flags need to be preserved. Save the RAR_INT3. This register contains the return address that rete is going to use to resume execution of the interrupted code. Change the TLBEHI's ASID. Since we are switching context, the pages won't be mapped the same way. From now on, accessing the data in the application space will give us the data from the new application space. restore RAR_INT3, so we can use rete to resume the task. The dataflash is accessed with the SPI bus. Since the dataflash is not a protable device and only the MCU can access it, it is a good opportunity to design my own file system. That memory will contain the boot script.